Few things come to mind when talking about passion fruit. For one, its name is already exciting in itself and seems to incite feelings of well, passion. A favorite among fruit aficionados and gourmet chefs alike, passion fruit produces a strong, tart and vibrant flavor that’s great for cooking or enjoying on its own. Native to South America, Asia, Australia and Hawaii, this tropical fruit boasts a bright pulpy interior with sweet, edible seeds. We know it’s hot this summer and you’re probably wishing to be somewhere tropical at the moment. Well, let’s just say passion fruit is the next best thing. One taste of this delicious fruit and you’ll see what we mean. 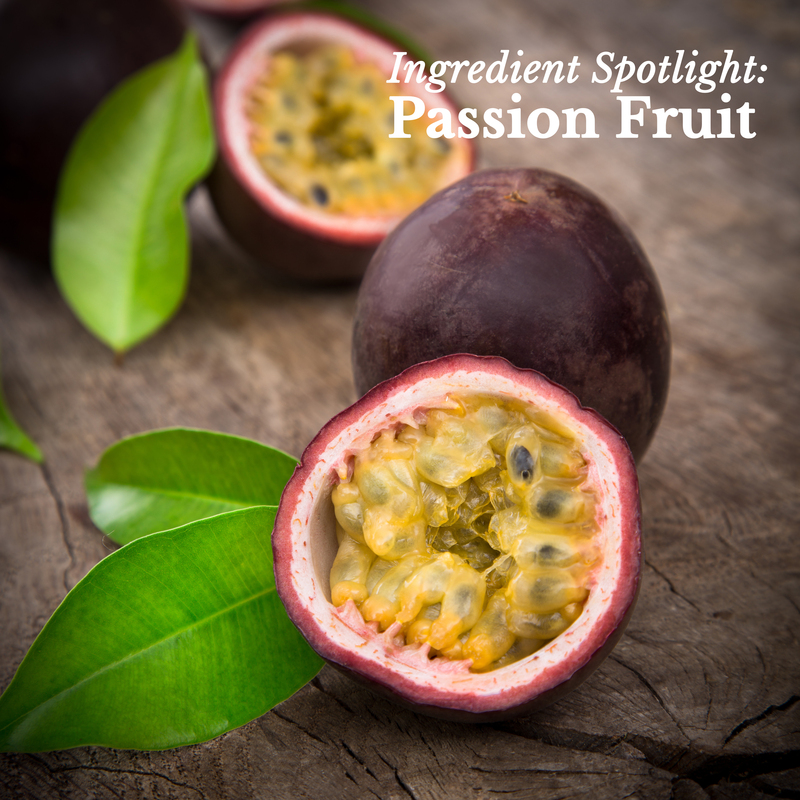 What to look for: Choose passion fruit that have a slightly wrinkled texture on its skin. Also, make sure its exterior is somewhat soft with a little give.The deeper the color of the skin, the riper it is. If you’re looking for optimum sweetness, then these will be your best bet. A good way of telling whether or not it will be juicy is to simply shake it. If you can hear a good amount of liquid inside, then that means that there are plenty of seeds and juice. Remember, it’s the inside that counts! And of course, smelling the fruit and taking in the fresh, tropical aromas can usually tell you if you’ve chosen the right. If there’s no smell, there’s probably no taste. Storage and Prep: Once you’re ready to eat the passion fruit, run them under cold running water and give them a good rinse and scrub.. Scoop out just enough to where the yellow flesh separates from the white part of the skin. Be careful not to remove any part of the white part because of its bitterness. If you prefer to enjoy it as it is, cut it in half and scoop out the flesh. If you’re trying to extract the juice, spoon out the flesh and seeds into a sieve and press with a large spoon. You may need a lot of passion fruit to gather a good amount of juice but if you plan to use it in a recipe, it’s well worth it! Passion fruit that’s already ripe can be stored in the refrigerator for several days. However, if it’s unripe, it’s best to store it outside of the refrigerator at room temperature for a couple of days. Uses and Recipes: While not quite as commonly found in grocery stores as strawberries and apples, passion fruit can be just as delicious when eaten fresh or in recipes. Its sweet and tart juice is highly prized in making sauces as well as desserts. Here are a few easy ways we’ve enjoyed passion fruit. Crunchy Passion Fruit Sweeties – A passion fruit filled parfait–need we say more? 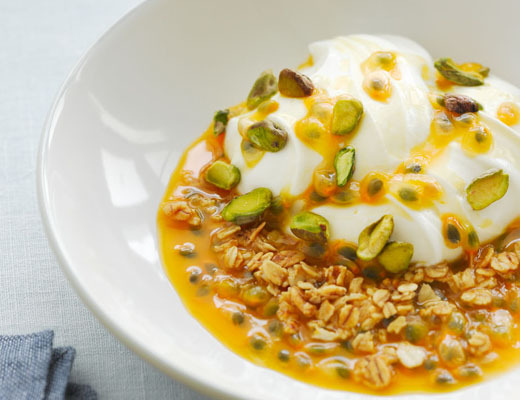 The sweet and sour flavors of the passion fruit add nicely complement the cool and refreshing backdrop of the Greek yogurt. Pistachios and granola give this dish a little extra crunch and a whole lot of nutty flavor. 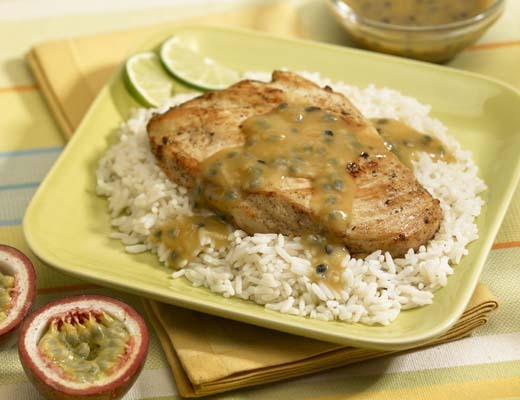 Passion Fruit Sauce over Chicken and Rice – Did we mention that passion fruit goes wonderfully in sauces? Keep a chicken dinner light by topping with a tangy passion fruit sauce. Double the flavor and half the calories. We love the savory contrast of the chicken against the sweet and tangy fruit sauce. You can also use the sauce on other tasty meat dishes as well. 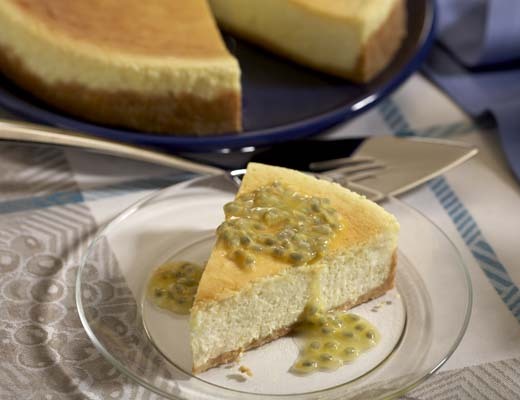 Passion Fruit Cheesecake – Cool, creamy and fruity, this cheesecake gets the royal treatment by infusing the tropical flavors of passion fruit into the filling. Don’t be intimidated by the recipe; cheesecake is simple to make in so many different ways. A tasty dessert that has double the fun in flavor and decor–this is something we wouldn’t mind eating all summer long. 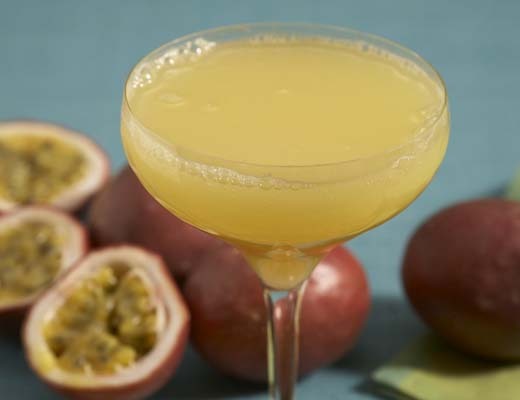 Passion Fruit Cocktail – A wonderful summer refresher, this passion fruit cocktail is one way to keep things sophisticated on a hot day. It’s made with your favorite sparkling wine, Grand Mariner and passion fruit juice. Do you need any more excuses to share cocktails with friends in the daytime? Have you ever tried passion fruit before? What’s your favorite way of enjoying them? Wow, didn’t know passion fruit looked like that. It tastes great as a slush with tapioca though!